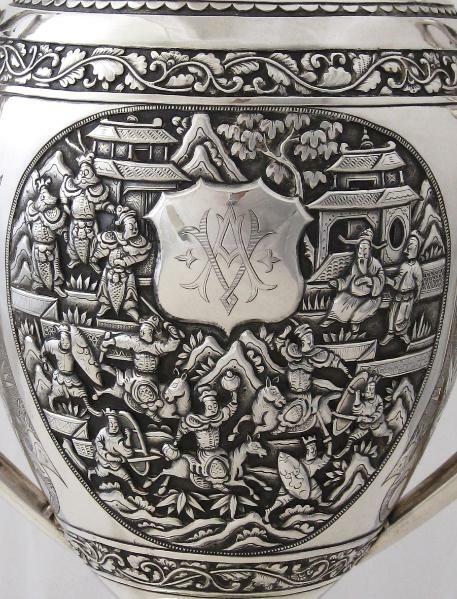 This elaborate standing cup and cover is by the Hong Kong and Canton maker/retailer Wang Hing. It stands trophy-like on a flared foot, with a plain stem and an egg-shaped body from which two prominent handles emerge. The lid, which is chased with a border of leaves to match a similar border on the foot, rises to a prominent finial. Both the front and back have oval cartouches elaborately decorated with Chinese courtly and battle scenes on one side and two pairs of phoenixes, humming birds and a peony amid branches, rocks and prunus blossoms on the other. 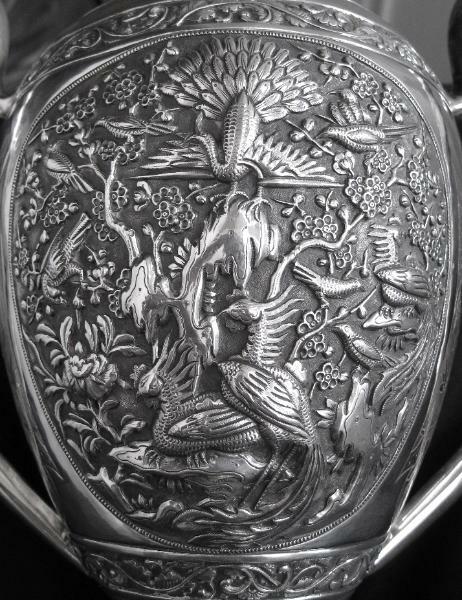 The body is further decorated with two bands of scrolling foliage and on either side, is engraved with two stylised bat shaped panels in-filled with clumps of bamboo against a ring-mat background. 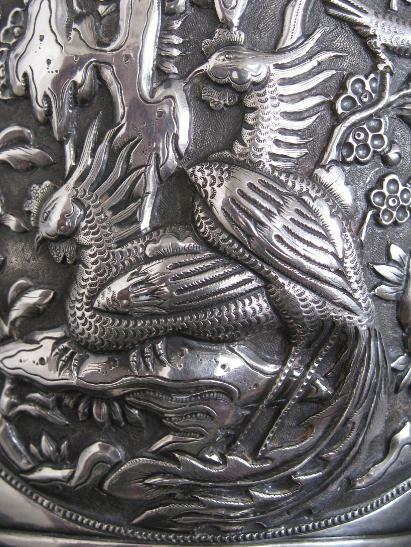 One of the main panels has a central armorial cartouche which is finely engraved with the initials ‘AV’. 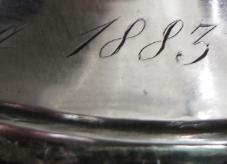 The lower part of the stem is engraved with ‘Hongkong 1883’ thereby allowing a manufacturing date of 1883 or earlier. 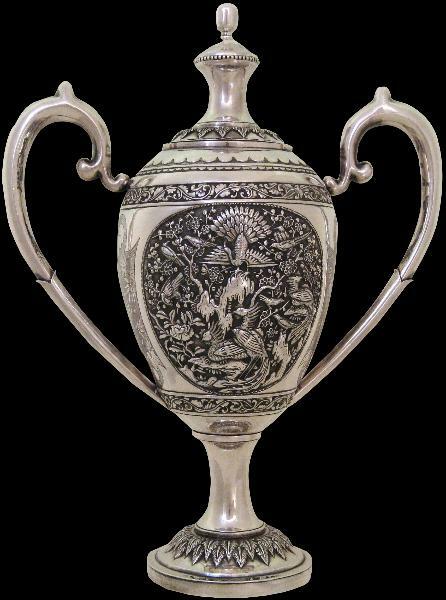 The interior of the cup retains a bright gold wash. The shop mark is located on the base beneath the hand-cut nut that screws onto the central post that holds the base to the body. In a single punch, it reads ‘Wang Hing/90 and an ideogram for ‘Da Ji’, a workshop. The ‘Wang’ is partly obscured by the hole for the cup’s central post. 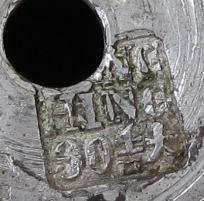 This mark is identical to one for a covered round silver box illustrated in Kernan (1985, p. 178) and which is also stamped with marks indicating that the box is a special order for the New York jewellery firm Tiffany & Co.
Wang Hing was a maker/retailer of top level export Chinese silver. The firms was patronised by Tiffany’s, Indian Maharajas, and other notables. 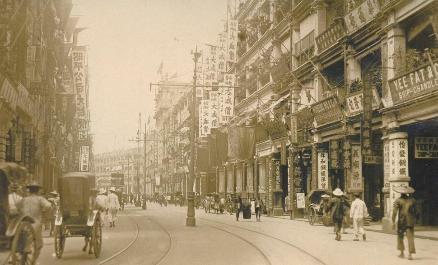 It had retail premises between 1875 and 1925 (approximately) at 10 Queen’s Road, Hong Kong. Another outlet was at 1 Sai Hing Street, Guangzhou. The firm enjoyed an excellent reputation and was a supplier to Tiffany & Co.
A standing up also by Wang Hing is illustrated in Marlowe (1990, p. 73). 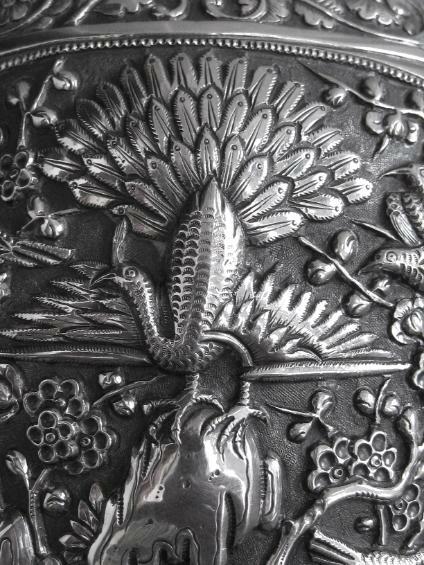 Kernan, J.D., The Chait Collection of Chinese Export Silver, Ralph M. Chait Galleries, 1985; and Marlowe, A.J., Chinese Export Silver, John Sparks, 1990.